Canberra Cannabis Legislation – The ACT is looking at legislation to allow for the use of medical marijuana. The Greens’ Shane Rattenbury advocates for it whilst the AMA cautions against, at least for now. Cosmo Cooma – Cooma could be the cosmopolitan capital of rural NSW. Its stories of migration and acceptance are being retold in front of the fire – and on the stage. Circus Kids – The kids of Warehouse Circus perform their tricks and tell their stories. They have a new show. Playing at Belconnen Community Theatre. A Nobler Prize – Canberra’s Butet Manurung has won a major international award (known as the Asian Nobel Prize) for her work providing alternative education for indigenous people in isolated and remote parts of Indonesia. 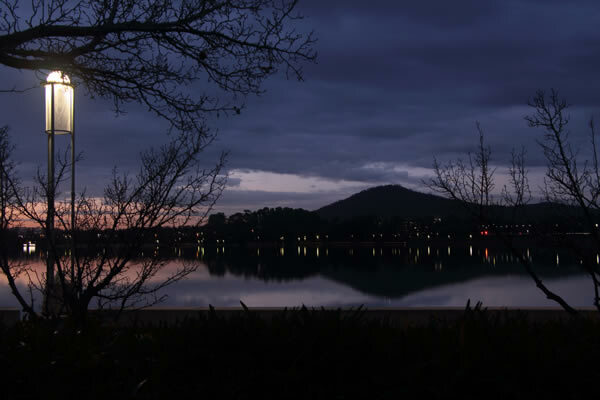 Photo on the set is by retired Canberran Glen Pure (The Lake from Questacon) – hoping to spend more time taking pictures.